A major clean-up operation is under way in Donegal after flash flooding in parts of the county yesterday. More than 20 houses, around a dozen business premises, many roads and bridges have been damaged in the Gaoth Dobhair, Derrybeg and Bunbeg areas. It follows torrential rain yesterday afternoon, which caused two rivers in Bunbeg to burst their banks. There were two landslides and many bridges in the area are now unsafe and being inspected by council officials. Gweedore library was badly damaged and all equipment and books have been spoiled. Two people had to be rescued by the coastguard after their house, which is in a hollow, was flooded by water up to 2m high. Residents of a nursing home had to be moved to another part of the home. 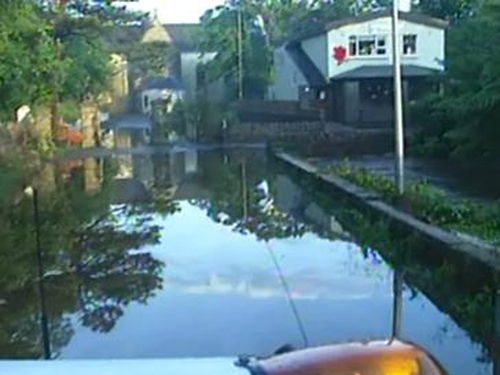 The flooding has now subsided but many areas are still affected. Senior Assistant Chief Fire Officer of Donegal Fire Service Sean Campbell described the weather as freakish. However, he said there were no fears of more flooding at the moment. Local Fine Gael TD Dinny McGinley is to raise a question in the Dáil about emergency funding being provided to help the people of the parish.